Also in the mix are videos on the latest from BionX (D Series motor) and Falco E-Motors electric bike kits. In case you missed it, here is a link to part 1 of the coverage with videos from Pedego, Haibike, eFlow, IZIP, Optibike, and BH Easy Motion. Ross Evans, founder of Xtracycle, shows off the Edgerunner cargo bike with the BionX electric bike kit at Interbike 2013. Ross Evans (Founder of Xtracycle) talks with Sam Moulton (Executive Editor of Outside Magazine) about the Outside Magazine award to Xtracycle for Best Gear of the Show (Interbike). Ben Sarrazin, President of Yuba Bicycles, shows off the El Mundo and El Boda Boda electric cargo bikes with the BionX electric bike kit. Ben also talks about how the combination of electric assist with a cargo bike is a great alternative to a car. Tora Harris, President of Juiced Riders, shows off the new Juiced Riders ODK 3.0 electric cargo bike. The new features include a huge 48V 22ah lithium ion battery, Tektro disc brakes front and rear, SRAM 3 speed internal gear rear hub, smoother throttle operation, and more. Also shown are some of the accessories that can be used on the Juiced Riders ODK e-cargo bikes. Neil Saiki, President of NTS Works, talks about the new NTS Works 2×4 electric cargo bike at Interbike 2013. Pete’s Electric Bikes (no relation to me) had an e-cargo bike on display. Casey Anderson, Global Training Manager at BionX, shows off the new BionX D Series electric bike system, the new 48V BionX battery, center mount console, new cassette freehub BionX motor, and Dahon folding bike with the new BionX L Class e-bike kit. Rakesh Dhawan, President of Falco E-Motors, shows off the HX 2.0 500 watt Falco E-Motors electric bike kit with ANT+ wireless display. Also shown are the 750 watt and the 1500 watt motors. 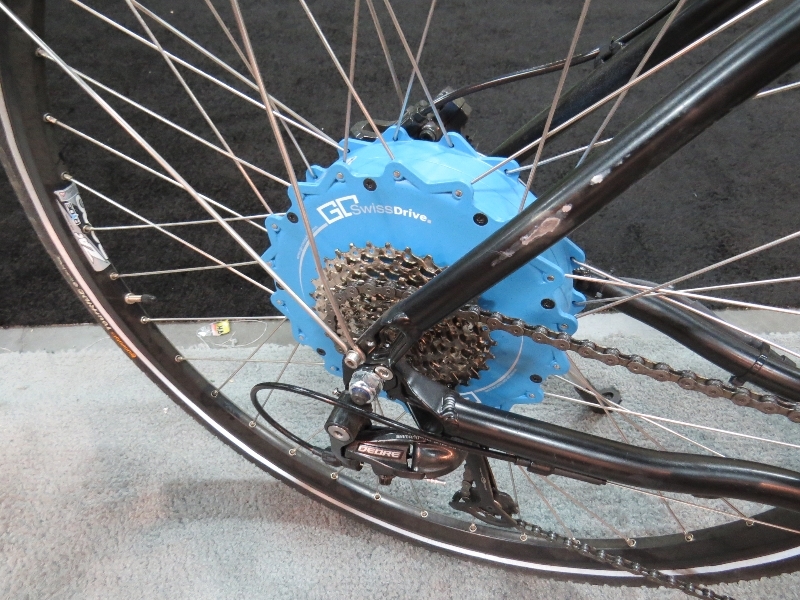 BMZ had an electric bike system on display that uses the Go Swiss rear hub motor. Go Swiss motor from BMZ. Lithium battery pack from BMZ. 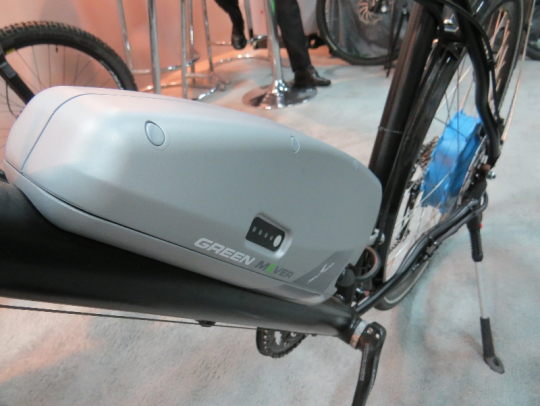 Pete’s Electric Bikes (no relation to me) has a new electric bike kit that uses the Go Swiss motor and battery pack from BMZ. 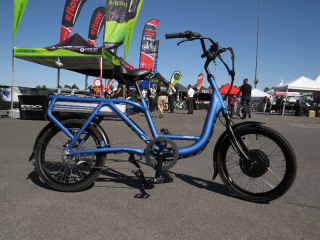 Now checkout part 3 with video coverage of OHM, Energie Cycles, Felt, Specialized, A2B, ProdecoTech, Polaris, & More! 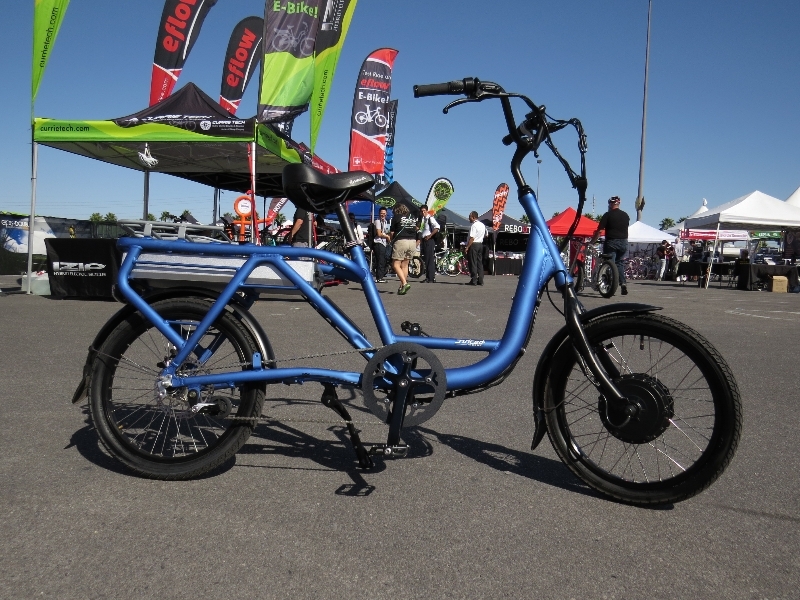 And in case you missed it, here is part 1 with video coverage from Pedego, Haibike, eFlow, IZIP, Optibike, and BH Easy Motion. Unfortunately I missed Falco at Interbike. Combining the controller with the motor and having a wireless display are great ideas. These ideas will save a lot of installation time and make neater bikes. Wish I understood what 5 phase motors mean. I test rode the Juiced Riders’ cargo bike and think the 20″ wheels and easy step through are excellent ideas for carrying cargo. I often load up my 70 cm wheeled bicycle for trips from the grocery or Home Depot and then fighting with a floppy steering and a kick stand that can’t hold the bike. Wish I had a Juiced cargo bike. I noticed your comment. I just started with Juiced Riders and would be happy to discuss this with you. YOu may email me if you wish with your contact information and I’ll get right back to you. You missed what many of us felt was the best kit system at the show. 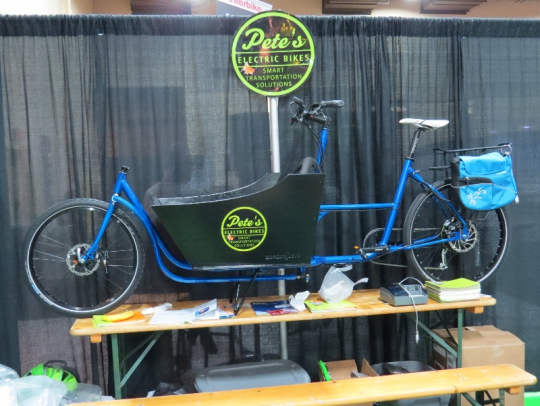 We saw and rode some bikes with the BMZ/Go Swiss hub motors, including two incredible cargo bikes, at the BMZ and Pete’s Electric Bikes booths. 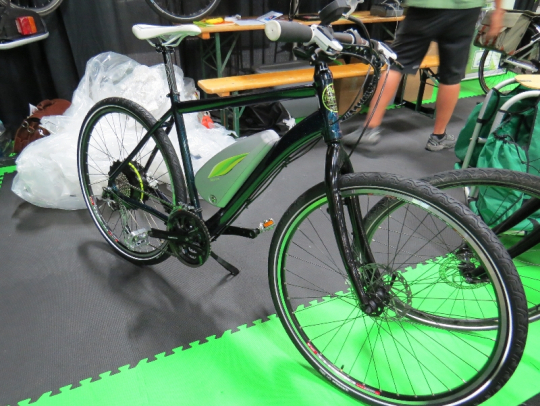 I found the green trekking bike with a BMZ kit that Pete’s was showing in the outdoor demo arena to be the best of them all. Good point Zennon. I just added some pictures of those.